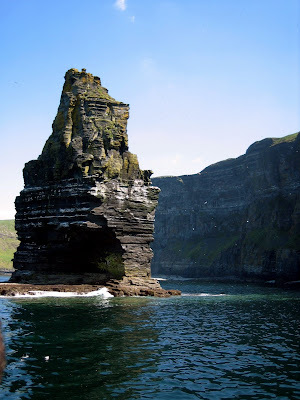 We spent our first three days in Ireland in County Clare, which is along the southwest coast of the country and home to the famed Cliffs of Moher, as well as the eerie landscape of the Burren. We actually flew over Clare on our descent into Ireland and got to see the Cliffs from the plane. That was a spectacular experience; I really did feel like a lifelong dream was coming true in that moment. Ireland from air is exactly what you would expect it to be--green, divided into messy plots by stone walls and lakes. 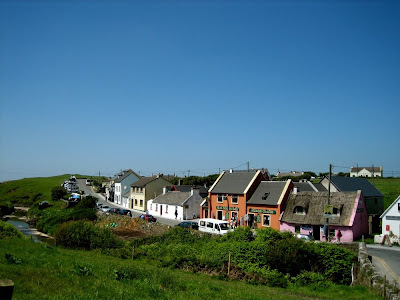 We flew into the Shannon airport and grabbed lunch in a perfectly picturesque little village called Ennistymon. A funny little woman named Mary sat at a table next to us and chattered our ears off the whole time. I found her quite charming, and she set the precedent for the rest of the trip. It's true what they say about Ireland--everyone is very friendly. 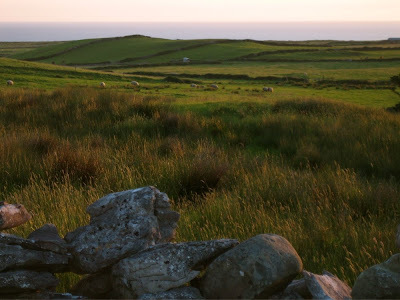 We stayed in Doolin, a seaside holiday town popular among Irish vacationers. 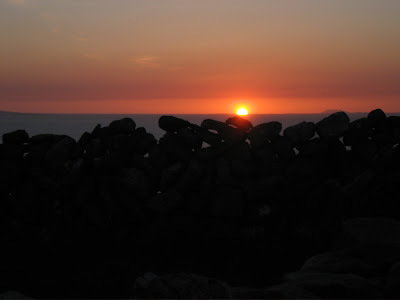 It was recommended in the guidebooks as the perfect place to experience the Irish music scene. My dad reserved an awesome self-catering cottage, with this view. That first jet-lagged night we ate our first of MANY meals of fish & chips and seafood chowder. I also had some minted peas that I can still taste in my mind to this day. We took a lovely walk to the end of a tiny road and watched the sunset over the ocean. 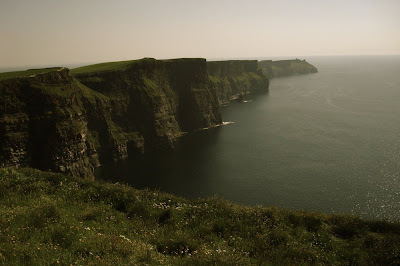 Day two was all about the Cliffs of Moher. First we took a boat ride right up alongside these sheer rock faces. 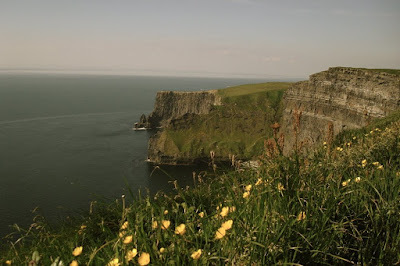 They are the tallest cliffs in western Europe and a habitat for thousands of birds. The boat ride was windy and refreshing, and I loved being able to get up close to see the stratum of rock. Glaciers are responsible for carving out and exposing layers upon layers of earth. To get the truly spectacular vista, however, one needs to hike up to the top of the cliffs at the visitor center. This is definitely a tourist trap, but I would stay trapped here year-round, if I could. I mean, come on. 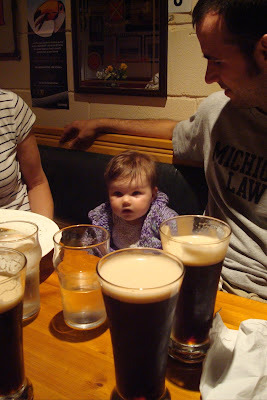 That evening, we checked out McCann's pub for dinner and some Guinness. Ellary lost a little bit of her innocence that night. McCann's hosts awesome Irish bands most nights, so we got to experience some real pub life. I think in some places you get a Disneyland version of the pub, because they know it's what Americans want, but every time we went to a pub, there were regular Irish folks there having a ball. A pub is considered to be a good one if it has good "craic" or atmosphere/mood/conversation. My brother Evan closed down the pub that night, hanging out with some Irish fellas. I, on the other hand, headed home early to get Ellary to bed. Our second full day in Ireland we drove through the Burren. 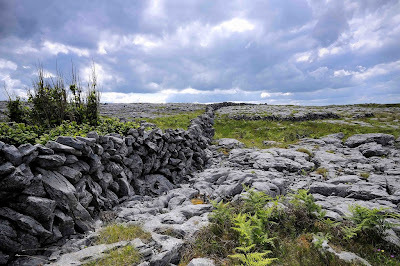 This region of Clare is extremely rocky, because it was farmed extensively for so long that the rockbed eventually ended up at the surface. It is a slightly lunar landscape. Since we drove through the Burren without stopping we didn't get any good pictures, but I thought I'd borrow one. And that'll do it for our time in Clare. 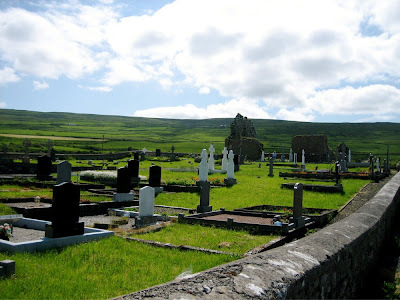 I'll leave you with a photo of this stunning cemetary with Celtic crosses galore. Ahhh, you take me back... Let's go again - soon! Love you and your gorgeous family!